/ What is Equine Experiential Learning? What is Equine Experiential Learning? >EEL is an educational model, and at Epona we employ the emotional message chart, the false self/authentic self paradigm, the body scan, the boundary handout and other tools to assist the clients in their personal awareness of feeling states, body sensations, boundaries and intrusive destructive thoughts. At Epona we teach individuals, through the Way of the Horse, to take their experiences home and make changes in their lives, if they choose. Our hope is that they can use these tools and experiences to change irrational thoughts and dysfunctional patterns, which have kept them stuck in a survival mentality, and help them shift them to move into a thriving place for more creative and productive lives. Only apprenticeship program graduates who are qualified Mental Health Workers according to the regulations of the state where they will practice will qualify to integrate EEL principles with their therapeutic or counseling approach. However, it is essential to distinguish between EEL and mental health models, particularly the area of Equine Facilitated Psychotherapy (EFP). Psychotherapy is a long-term process involving one-on-one therapeutic sessions with a client and the therapist. It requires an intimate connection and at least weekly sessions. We do not teach psychotherapy in Epona programs. At the dawn of the 21st century, horses are breaking out of their roles as beasts of burden, yet they’re far from obsolete. As horses are no longer required to work in our fields and carry us to war, they’re doing something arguably more important: working on us. 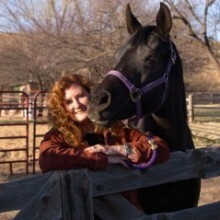 Founded in 1997 by author, lecturer and horse trainer Linda Kohanov, Epona Equestrian Services has received international attention for horse training and breeding innovations, as well as educational programs that employ horses in teaching people leadership, assertiveness, personal empowerment, relationship, intuition, and emotional fitness skills. Amateur and professional equestrians, families, counselors, artists, educators, and business leaders travel from around the world to attend workshops and private sessions with the Eponaquest herd. Since 2002, Kohanov and her staff have also trained over 150 Eponaquest Instructors who now offer Eponaquest-based programs on five continents.